Mit dem Splitzer kannst du ein Viertel oder eine Hälfte des Bildes wegschneiden. Du entscheidest, was genau erscheint. With a Diana F+ in hand, it´s nice to take a straight-off, one-shot image of your favorite person, animal, or thing. But what about going past that large, single full-frame? How about slicing & dicing it into halves and quarters? What about dictating exactly what appears on your photo and exactly where it appears? Take that subject in front of your face and slice it straight down the middle. Slap it onto the right side of your image, and then take a breath. What do you want on the left? That is the beauty of the choice is yours! You no longer just take the shots; you´ll never look at a Diana+ image as a single whole again. . Two small plastic blades can be turned to cut your image into halves, quarters, eighths, and sixteenths. Image parts bleed seamlessly into on another. 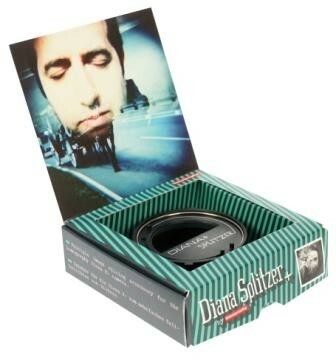 The Diana+ Splitzer easily slips on and off the Diana+ lens and works with all Lomography Diana+ and Diana F+ cameras.